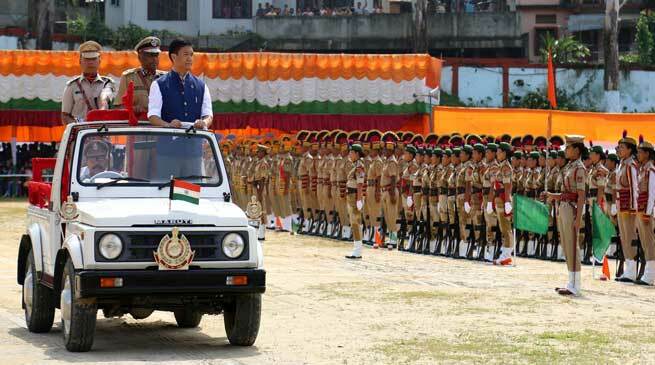 Arunachal Pradesh Chief Minister Pema Khandu in his Independence Day speech announced Rs. 50 lakh ex-gratia and conferred the state’s highest award ARUNACHAL RATNA to DSP late Bomto Kamdak for his supreme sacrifice on duty. Pema Khandu also committed to give a suitable job to Bomto’s wife. East Kameng deputy superintendent of police (DSP) Bomto Kamdak was killed in a shootout at Sangrungwa camp near Yangfo village in Chayang Tajo ADC headquarters of East Kameng in Arunachal Pradesh on Saturday evening. Addressing the gathering Pema appeals to the people that “Arunachal Pradesh is considered an island of peace and we must maintain that image forever. We should stand united against divisive forces and thwart all attempts to disturb our unity and social harmony”. Pema also assured the people that his government will not tolerate any sort of criminal activities nor would spare any criminal irrespective of his or her background, position or connections. At all costs, law of the land will prevail. mission for us today is to generate our own resources and one way is to attract private investment. For this we shall formulate an institutional mechanism by constituting the ‘Arunachal Pradesh Investment Advisory Council’. We will engage the best brains in the industry to advice the Government in leveraging investment in our state, said chief minister. He also said “I believe in the mantra of people-oriented holistic development through an efficient work culture in every sphere. Therefore, Digital Governance shall be the number one agenda of the State Government”, before announcing the start of the first electronic paperless office today. “I reiterate that my government firmly believes working with a team spirit. With each one of you as members – Team Arunachal, based on unity and collective responsibility – will be the core force to bring new strides of development in the state”, said CM Pema Khandu.